1. Send out an e-mail to all of your past customers. With the new products and price lists. Be sure to include the Freeze Dried Frenzy promotion. 2. Set a goal about building your team. What are you going to accomplish this month? How are you going to get there? 4. March parties: Do you have yours scheduled? If not here are a few ideas. c. Check out the expos, home and gardens shows, or other gatherings in your area. Sponsor a booth. d. Teach a class on food storage/home store through your local community education. It is critical that as a consultant you understand how the compensation plan works. I hope you were able to listen to last week’s call about it. I want to go over it again because I think it is so important that you understand. There are four ways that consultants make money. Here they are. When you conduct a Shelf Reliance Party you earn commission on sales made at the party. 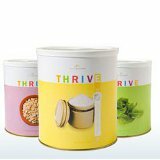 All orders not placed through the THRIVE Q, including Food Rotation Systems, Emergency Supplies and one time THRIVE orders, will be paid out at a 10% commission rate. You will receive 20% - 32% commission for those you set up on the THRIVE Q. This is what most of us think about because, in the very first check you get from shelf reliance this is what you are probably getting paid for. This 10% is probably the majority of your monthly check. (for now anyway). When you sign someone up on the Q. You get paid commission when the Q processes (so often for me it is the next month). The first month of a Q you get 20-32% of the order in commission. That percent is on a sliding scale based on how much Q sales you have that month. On the second month (and ever month after that) you receive a 5% reoccurring commission check monthly! When you sign a consultant up you receive commission on their Q. You do not receive commission on your own Q. 3. Host Your Own Party—Receive the Host benefits and your regular commission (10% commission and 10% in free product as the host benefit). When you host a party with your own family and friends, you will receive the same benefits as when you conduct a party for someone else. However, since you are hosting the party, you will also receive host benefits. Any sales that come in outside of a party you get to count as if you were the host for a party. You should always have a party set up for these outside sales. I name mine after the month, or season. So I just closed a party I called “Winter” that included all of the outside sales I did during January and the first week of February. 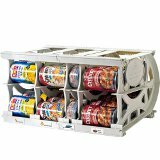 This is a great benefit and a great way to build your own food storage or build up your party supplies. Remember host benefits can be used on any product. Build a Team-$50 sign up bonus, and 1-2% commission on three levels under you. Enroll others to join your team as consultants and earn $50 each time! As your team grows, you will also receive commissions from all of your consultants' parties, sales, and THRIVE Q signups for up to 3 levels below you. To receive payment for the commission on those under you, you need to be the rank of Mentor or above. I was showing this chart to a new consultant the other day. And she didn’t think she would ever reach mentor. Those numbers seemed so high to her. And then she had her first party which was a $900.00 party (which is pretty average). With only one great party she has almost made it to her personal monthly sales to be a mentor. She still needs some more team sales but that will come and if not she could reach it on her own. With a couple more great parties she would be there this month. I don’t send this e-mail to frustrate you. I know that this business is not a microwave, it is really more like a crock pot. For me it has been slow going. I signed up as a consultant last March and my business did not really take off until the late fall. It felt like an eternity. But looking back it really was not that long. Shelf Reliance has a commission calculator that if you have not looked at you NEED to. Play around with the numbers. I have included an example of how your commissions can work. You won’t be able to change the number is this document to play around with it but you can see what kind of earning potential there is. The above example does not maximize my earning potential. Look at if I make just a few changes how things change. What did I change? In the below example I am doing 1.5 parties a week (still doable in my book) I am doing 10 sales per party instead of 8 (still doable). My average sale is $100. Yet again doable. I left the number of Q customers the same 50. And the average Q the same $70. On the down line consultants I change my level one to 12, and my level 2 to 24. All of which is achievable over time. Now look at the numbers. Did you read that! I hope that makes you as excited as it makes me. Now do I really think that I will be there is one year. No but maybe in 3 years. I gotta tell you that I am much happier having a HUGE goal and not reaching it then having a wimpy goal and reaching it. 2. Explain the commission structure to another adult. Your husband, sister, mom. If you can explain it then you probably understand it. 3. Create a script of how you would explain the commission structure to a potential consultant. (this is hard, you only have a few minutes and it is pretty complicated) Write it down. If you do the next time a potential consultant asks you about it you will be able to give a good answer.